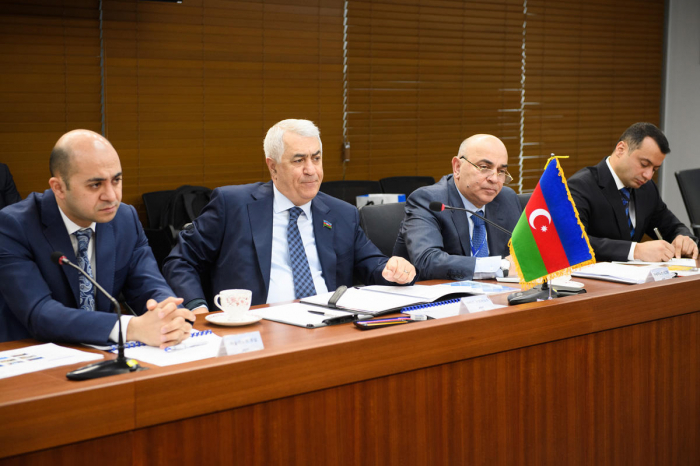 The Baku-Tbilisi-Kars (BTK) railway is the shortest route between China and Europe, Javid Gurbanov, chairman of Azerbaijan Railways CJSC, said at a meeting with President of Korea Railroad Corporation (KORAIL) Son Byung-seok in Seoul, AzVision.az reports April 10 with reference to CJSC. During the meeting held with the participation of big delegations, Son Byung-seok thanked Javid Gurbanov for his support in the issue of the membership of the KORAIL in the Organization for Cooperation of Railways and its participation in the 34th meeting of directors general of the Organization for Cooperation of Railways. In turn, Gurbanov told about the transport and logistics potential of Azerbaijan and the transformations carried out in the country’s railways. He presented detailed information on the Baku-Tbilisi-Kars railway, the North-South and South-West transport corridors and the Trans-Caspian International Transport Route. He said that the Trans-Caspian International Transport Route provides transportation of goods from China to Europe and in the opposite direction. One of the most important achievements in increasing the competitiveness of the Middle Corridor is the commissioning of the BTK railway corridor, he noted. Being an integral part of the Middle Corridor, the BTK is the shortest route between China and Europe, he said. The KORAIL could consider joining the Middle Corridor project in order to carry out regular shipments to Europe, using the wide terminal capabilities of the Lianyungang and Busan ports. As part of the meeting, the sides discussed issues of expanding bilateral ties. During the visit to South Korea, the Azerbaijani delegation also got acquainted with the work of the Busan port.